On 16 October 2018, a new statue was inaugurated in front of Piccadilly Station. ‘Victory over Blindness’ commemorates the returning blind veterans who fought during the Great War. It depicts seven First World War ex-servicemen, supporting each other. All had lost their sight during wartime service and were now set upon the path to rebuilding their lives after the conflict. More than 3000 soldiers lost their sight during WWI. The charity St Dunstan’s, now known as Blind Veterans UK, was established in 1915. It aimed to help these men recover and live independently. Today, the Blind Veterans UK continues its work with 4,700 men and women who are visually impaired as a result of their service. It seeks to reach out to 50,000 others who are eligible for their support without being aware of it. The creator of the statue, Johanna Domke-Guyot has a strong link to Blinds Veterans UK. She was diagnosed with multiple sclerosis in 1994. As a result, she lost sight in her right eye. Johanna decided to study fine arts to cope with this. Her sculpture takes inspiration from a picture she saw of servicemen, blinded during combat. They were leading each other away from the Front. The sculptures are life-sized, allowing passers-by to interact with the installation — something which is crucial to Johanna. Manchester Piccadilly is a particularly propitious location for the monument. Indeed, this was where many wounded veterans disembarked; they would then have set upon their journey to reintegrate into civilian life after the war. 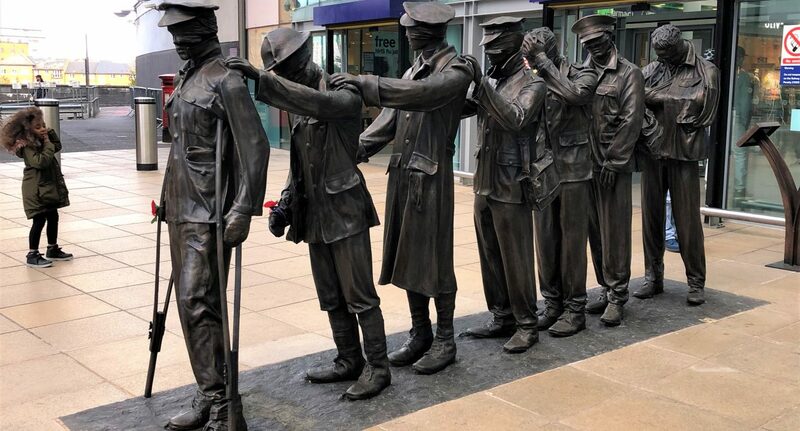 Each of the seven individuals depicted in the statue has been paired with both a blind veteran from the First World War and a current, blinded veteran. You can read the stories of these men and women who rebuilt their lives after losing sight on the Blind Veterans UK website. As noted on the website, there are 77,000 war memorials in the UK, Channel Islands, and Isles of Man registered on the Imperial War Museum’s War Memorial Register. Out of these, not one memorial depicts a disabled service person. ‘Victory Over Blindness’ is the very first one to do so. This profoundly moving memorial leaves us wondering what Britain has done, and still needs to do in order to remember those whose lives were changed forever during WWI as a consequence of their war wounds. One is also brought to reflect upon all those who were wounded in subsequent wars and how their daily lives can be improved today, given the proper support. You can also watch Cachella Smith’s piece on the ‘Victory Over Blindness’ memorial on Fuse TV.